Every day, a new portrait ! The diversity of the French capital city at your fingertips. of more than three years of wanderings and encounters. Marco is the co-founder of the Humans of Paris community, and posts every day (or close to) a new portrait of a Parisian. 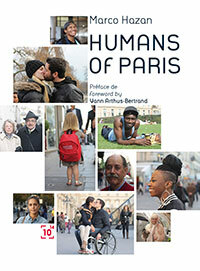 The book Humans of Paris gathers more than 450 previously unpublished pictures, each with an anecdote, story, ou dialogue born out of the encounter between the photographer and its subjects. The ones who made everything possible. Marco also likes to get mail, so do not hesitate to contact him ! Cent Mille Milliards is a new publishing house, with an already strong and diverse catalog : novels, short stories, debates, cooking, ideas… Furthermore, it has adapted its business model and practices to the modern digital age. The connection with Humans of Paris was instantaneous, and the potential for an ambitious and beautiful book appeared quickly. That potential is today materialized in the book that you will soon hold in your hands.